England, 1882. Evelyn is bored with society and its expectations. So when her beloved sister, Rose, mysteriously vanishes, she ignores her parents and travels to London to find her, accompanied by the dashing Mr. Kent. But they're not the only ones looking for Rose. The reclusive, young gentleman Sebastian Braddock is also searching for her, claiming that both sisters have special healing powers. Evelyn is convinced that Sebastian must be mad, until she discovers that his strange tales of extraordinary people are true--and that her sister is in graver danger than she feared. "This tale has brisk pacing, plenty of action, and a heroine with more than her fair share of girl-power confidence." "School Library Journal"
I need book two!! Where is book two This sucked me in right away (it was a terrible idea to start reading on a break at work I could barely bring myself to go back to work) and kept me engaged the whole way through. Some really great characters. (Also any book that mentions self-defenestration wins). But seriously, can I read book two now Erin Keskeny, Swoon Reader"
Mild-mannered assistant by day, milder-mannered writer by night, Tarun Shanker is a New York University graduate currently living in Los Angeles. His idea of paradise is a place where kung-fu movies are projected on clouds, David Bowie's music fills the air and chai tea flows freely from fountains. Kelly Zekas, an NYU graduate, writes, acts, and reads in New York City. YA is her absolute favorite thing on earth (other than cupcakes) and she has spent many hours crying over fictional deaths. She also started reading Harlequin romances at a possibly too early age (12? ), and still loves a good paperback romance. 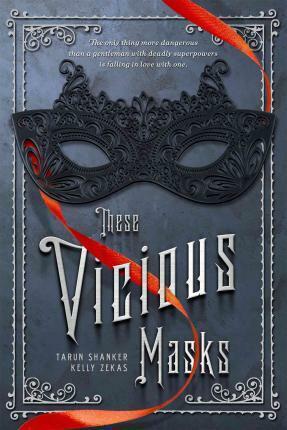 These Vicious Masks is their first novel.